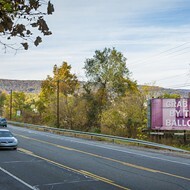 Michele Pred, For Freedoms Billboard, 2018. If your commute takes you westbound on 1-44, you may have spotted a billboard between the Kingshighway and Hampton exits that appears to advertise nothing less than the radical idea (in Missouri, at least) of sovereignty over your own body. What's that all about? 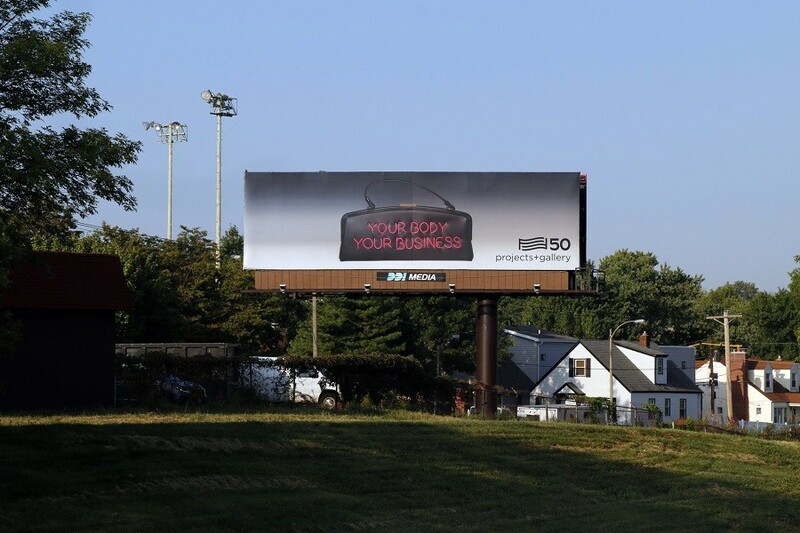 The billboard in question, Your Body Your Business, was designed by artist Michele Pred as part of the nationwide art project For Freedoms 50 State Initiative. Its name and inspiration are drawn from President Franklin Roosevelt's idea that Americans are born with four innate freedoms: freedom of speech and expression, freedom from want, freedom from fear and the freedom to worship. 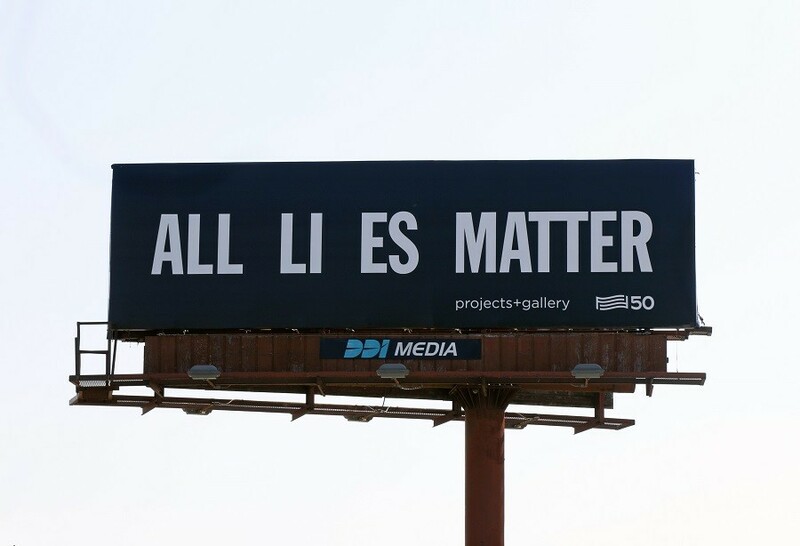 Pred's contribution is one of three such artist-designed billboards now up in the metro area, all sponsored by the Central West End's Projects+Gallery. 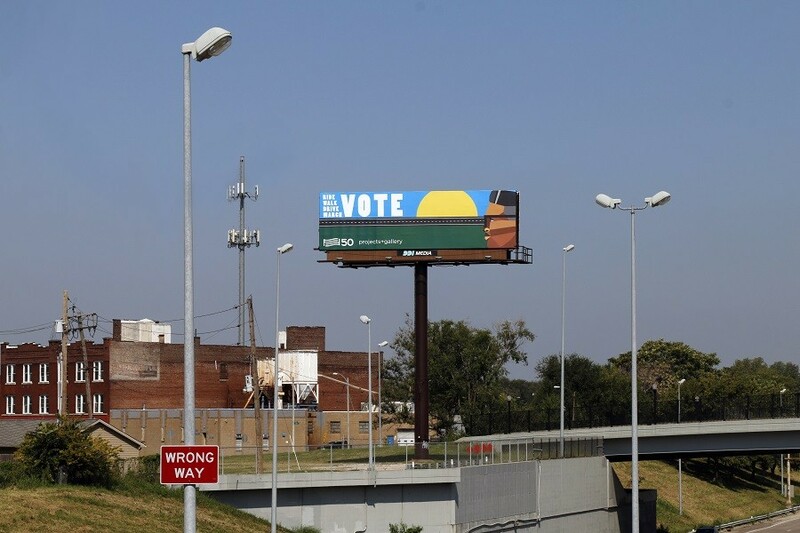 Derrick Adams' Ride Walk March Vote is installed alongside I-70 west near Cass Avenue as you approach the Stan Musial Memorial Bridge, and Hank Willis Thomas' All Li es Matter is situated in St. Charles along I-70 east just before the exit for 5th Street. Hank Willis Thomas, For Freedoms Billboard, 2018. Founders Eric Gottesman and Hank Willis Thomas created the For Freedoms project in hopes of using art as a means to foster conversations about education, race and advertising, particularly in the run-up to a crucial midterm election. 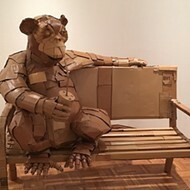 It seems like a long shot — do you know any MAGA folks who love both dissenting viewpoints and art? — but in dire times, you gotta be willing to try anything. A tie-in art show, Cry of Victory and Short Walks to Freedom, opens October 18 at Projects+Gallery. Curated by Modou Dieng, it features work by Kwame Braithwaite, Esmaa Mohamoud, Xaviera Simmons and eleven other artists. And on November 1, the Contemporary Art Museum hosts a town hall discussion about the project, freedom and art with artist-activists Hank Willis Thomas, Nicole Hudson and Tef Poe. Derrick Adams, For Freedoms Billboard, 2018. Editor's note: This post was updated after publication to make it clear that not every museum partnering on this project will have signs available all the time. We also added COCA to the list of participants and added the name of the curator for the Projects + Gallery show.